George Steinbrenner, who rebuilt the New York Yankees into a sports empire with a mix of bluster and big bucks that polarized fans all across America, died Tuesday. He had just celebrated his 80th birthday July 4. Steinbrenner had a heart attack, was taken to St. Joseph's Hospital in Tampa, Fla., and died at about 6:30 a.m, a person close to the owner told The Associated Press. The person spoke on condition of anonymity because the team had not disclosed those details. His death was the second in three days to rock the Yankees. Bob Sheppard, the team's revered public address announcer from 1951-07, died Sunday at 99. For more than 30 years and through seven World Series championships, Steinbrenner lived up to his billing as "the Boss," a nickname he earned and clearly enjoyed as he ruled with an iron fist. George was the Yankees. He was involved in every aspect of the Yankees from the board rooms to the bathrooms, reports CBS News correspondent Armen Keteyian. Every last detail devoted to what Steinbrenner craved above all else: Winning. "She show me a good loser and I'll show you a loser," said Steinbrenner in an interview. In 1987, Steinbrenner told 60 Minutes' Ed Bradley that he hated to lose and he didn't care if his players liked him. "I'd like them to respect me and sometimes that doesn't happen," he said. "What I like to do is instill a sense of discipline in my players. I don't want players going out there and being treated like heroes if they don't act like heroes." While he lived in Tampa he was a staple on the front pages of New York newspapers. Steinbrenner's mansion, on a leafy street in an older neighborhood of south Tampa, was quiet Tuesday morning. Private security guards milled around on the empty circular driveway inside the iron gates. A police officer took up a position outside the gates to turn away reporters and keep traffic moving along the narrow street. News vehicles lined the other side of the street. "The passing of George Steinbrenner marks the end of an era in New York City baseball history," rival Mets owners Fred and Jeff Wilpon and Saul Katz said. "George was a larger than life figure and a force in the industry. The rise and success of his teams on the field and in the business marketplace under his leadership are a testament to his skill, drive, and determination." Steinbrenner was known for feuds, clashing with Yankees great Yogi Berra and hiring manager Billy Martin five times while repeatedly fighting with him. But as his health declined, Steinbrenner let sons Hal and Hank run more of the family business. 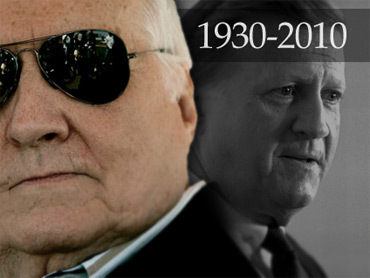 Steinbrenner was in fragile health for years, resulting in fewer public appearances and pronouncements. Yet dressed in his trademark navy blue blazer and white turtleneck, he was the model of success: In addition to the World Series titles, the Yankees won 11 American League pennants and 16 AL East titles after his reign began in 1973. "Few people have had a bigger impact on New York over the past four decades than George Steinbrenner," Mayor Michael Bloomberg said in a statement. "George had a deep love for New York, and his steely determination to succeed combined with his deep respect and appreciation for talent and hard work made him a quintessential New Yorker." He appeared at the new Yankee Stadium just four times: for the 2009 opener, the first two games of last year's World Series and this year's homer opener, when captain Derek Jeter and manager Joe Girardi went to his suite and personally delivered his seventh World Series ring. "He was very emotional," said Hal Steinbrenner, his father's successor as managing general partner. Till the end, Steinbrenner demanded championships. He barbed Joe Torre during the 2007 AL playoffs, then let the popular manager leave after another loss in the opening round. The team responded last year by winning another title. Steinbrenner had fainted at a memorial service for NFL star Otto Graham in 2003, appeared weak in 2006 at the groundbreaking for the new Yankee Stadium and later became ill while watching his granddaughter in a college play. In recent times, Steinbrenner let sons Hal and Hank run more of the family business. Still, the former Big Ten football coach took umbrage when others questioned his fitness. "No, I did not have a stroke. I am not ill. I work out daily," Steinbrenner said in 2006. "I'd like to see people who are saying that to come down here and do the workout that I do." When Steinbrenner headed a group that bought the team on Jan. 3, 1973, he promised absentee ownership. But it didn't turn out that way. Steinbrenner not only clashed with Berra for more than a decade but paid to dig up dirt on Dave Winfield, deriding the future Hall of Famer as "Mr. May" in 1985 after poor performances. Berra spoke from the heart Tuesday when he said, "We went through some bad times and everybody else did but he was a wonderful man." While he liked to appear stern, Steinbrenner could poke fun at himself. He hosted "Saturday Night Live," clowned with Martin in a commercial and chuckled at his impersonation on "Seinfeld." He quietly contributed millions to charity, silently funding college tuitions and life-saving operations for strangers he read about in the New York newspapers, reports Keteyian. And his beneficence extended beyond sports. He pledged $1 million to a Florida orchestra in 1995 and mandated that $265,000 go to a pops series. "I like Tchaikovsky as much as the next guy," he said, "but in this area I think people would rather hear pops concerts, and good ones." The Yankees paid off for him, too, with their value increasing more than 100-fold from the $8.7 million net price his group paid in January 1973. He freely spent his money, shelling out huge amounts for Jeter, Reggie Jackson, Alex Rodriguez, Torre and others in hopes of yet another title. "Winning is the most important thing in my life, after breathing," Steinbrenner was fond of saying. "Breathing first, winning next." All along, he envisioned himself as a true Yankee Doodle Dandy. It was fitting: George Michael Steinbrenner III was born on the Fourth of July, in 1930. Added up, he joined the likes of Al Davis, Charlie O. Finley, Bill Veeck, George Halas, Jack Kent Cooke and Jerry Jones as the most recognized team owners in history. Steinbrenner's sporting interests extended beyond baseball. He was an assistant football coach at Northwestern and Purdue in the 1950s and was part of the group that bought the Cleveland Pipers of the American Basketball League in the 1960s. "A lot of people didn't like him, but I liked him," former Yankee Tim Raines said. "He respected me as a player and I respected him for being the Boss. He always talked to me about his football days because he knew I played football." He was a vice president of the U.S. Olympic Committee from 1989-96 and entered six horses in the Kentucky Derby, failing to win with Steve's Friend (1977), Eternal Prince (1985), Diligence (1996), Concerto (1997), Blue Burner (2002) and the 2005 favorite, Bellamy Road. To many, though, the Yankees and Steinbrenner were synonymous. His fans applauded his win-at-all-costs style. His detractors blamed him for spiraling salaries and wrecking baseball's competitive balance. Steinbrenner never managed a game, as Ted Turner once did when he owned the Atlanta Braves, but he controlled everything else. When he thought the club's parking lot was too crowded, Steinbrenner stood on the pavement - albeit behind a van, out of sight - and had a guard personally check every driver's credential. Steinbrenner made no apologies for bombast and behavior, even when it cost him dearly. He served two long suspensions: He was banned for 2½ years for paying self-described gambler Howie Spira to dig up negative information about Winfield, and for 15 months following a guilty plea in federal court for conspiring to make illegal campaign contributions during the Watergate era. "I haven't always done a good job, and I haven't always been successful," Steinbrenner said in 2005. "But I know that I have tried." Steinbrenner negotiated a landmark $486 million, 12-year cable television contract with the Madison Square Garden Network in 1988 and launched the Yankees' own YES Network for the 2002 season. All that cash, the Yankees later became the first team with a $200 million payroll, provoked anger and envy among other owners. After the 1982 season, Baltimore owner Edward Bennett Williams said Steinbrenner hoarded outfielders "like nuclear weapons." When Steinbrenner bought the Yankees, he insisted he was too busy with his family's shipbuilding business to take an active role in running the club. As his partners soon found out, that wasn't quite the case. "There is nothing quite so limited as being a limited partner of George Steinbrenner's," one of them, John McMullen, said later. Overall, he changed managers nearly two dozen times and got rid of more than a dozen general managers. When a Yankees' public relations man went home to Ohio for the Christmas holiday, then returned in a hurry for a news conference to announce David Cone's re-signing, Steinbrenner fired him. After Steinbrenner fired Berra as manager 16 games into the 1985 season, the Hall of Famer vowed he wouldn't go to back to Yankee Stadium for a game until Steinbrenner apologized 14 years later. On one pressure-filled night in 1982, reliever Goose Gossage let loose and called Steinbrenner "the fat man." And in 1978, Martin said of Jackson and Steinbrenner: "The two of them deserve each other - one's a born liar, the other's convicted." There was no denying the results, however. When Steinbrenner bought the Yankees, they had gone eight seasons without finishing in first place, their longest drought since Babe Ruth & Co. won the team's first pennant in 1921. Under Steinbrenner, the Yankees reached the World Series on 10 occasions and won three straight championships from 1998-2000. Those titles started a run in which the Yankees won the AL East crown every season through 2006. "We've disagreed on more things than we agreed upon, but it never affected our personal relationship," commissioner Bud Selig said in 2005. "George has been a very charismatic, controversial owner. But look, he did what he set out to do - he restored the New York Yankees franchise." Former AL president Gene Budig sometimes was on the wrong end of Steinbrenner's barbs. After he left office, Budig maintained a friendship with him and even advocated Steinbrenner getting into the Hall of Fame. Steinbrenner liked to quote military figures and saw games as an extension of war. No surprise that in the tunnel leading from the Yankees' clubhouse to the field, he had a sign posted with a saying from Gen. Douglas MacArthur: "There is no substitute for victory." Steinbrenner also had a soft side. He sometimes read about high school athletes who had been injured and sent them money to go to college. He paid for the medical school expenses of Ron Karnaugh after the swimmer's father died during the opening ceremony at the 1992 Barcelona Olympics. Steinbrenner kept older friends from his football days on the payroll, had a way of rehiring those he had once fired and liked to give second chances to people who had fallen from favor, such as Darryl Strawberry and Dwight Gooden. Steinbrenner was always sensitive to the immigration issues of his players, notes CBS News foreign affairs analyst Pamela Falk. "He sent his private plane to bring El Duque's (Orlando Hernandez) daughter's to New York, when they sought asylum," said Falk, who worked with Steinbrenner when the Yankee pitcher's daughters came to the U.S.
"I'm really 95 percent Mr. Rogers," Steinbrenner said as he approached his 75th birthday, "and only 5 percent Oscar the Grouch." While Steinbrenner grew up in the Cleveland area as a Yankees fan, his first passion was football. He fondly recalled watching the Browns on cold winter days and many believe the NFL's must-win-today mentality shaped how he approached all sports. Steinbrenner was raised in a strict, no-nonsense household headed by his father, Henry. The youngest of three children, Steinbrenner attended Culver Military Academy in Indiana. At Williams College, he was a track man and specialized in hurdles. After that, he enlisted in the Air Force. Steinbrenner always was partial to the military and at Yankee Stadium, men and women in uniform were admitted free. Following his discharge, he enrolled at Ohio State, pursuing a master's degree in physical education. It was his intention to go into coaching, but after working at a high school in Columbus and at Purdue and Northwestern, he turned to the business world. Steinbrenner married Elizabeth Zieg in 1956 and they had four children. In 1963, Steinbrenner purchased Kinsman Transit Co., a fleet of lake ore carriers, from his family and built a thriving company. Four years later, Steinbrenner and associates took over American Shipbuilding and revitalized the company, helping annual revenues triple. It was in Cleveland that Steinbrenner met veteran baseball executive Gabe Paul and became involved with the group that bought the Yankees. With 13 partners, Steinbrenner purchased the team from CBS Inc. He clearly liked the status it gave him. "When you're a shipbuilder, nobody pays any attention to you," he said. "But when you own the New York Yankees ... they do, and I love it." Steinbrenner quickly worked to reshape the team he loved as a boy. With that, the Bronx Zoo days began. It was while he was under suspension that the Yankees ushered in baseball's new free-agent era by signing Catfish Hunter to a $3.75 million contract. Even though he was officially barred from participating in the daily operation of the team, no one believed that Steinbrenner was not involved in that deal. Hunter was the first player to cash in on baseball's new economic structure and no owner plunged into the marketplace more than Steinbrenner. He saw it as an opportunity to assemble quality players and was one of the biggest buyers. For the first five years of the free agency, Steinbrenner signed 10 players at an approximate cost of $38 million. Steinbrenner's $18.2 million, 10-year deal with Winfield was the richest free agent contract in history. During those days, Yankee Stadium underwent a $100 million facelift and reopened in 1976. That year, the Yankees won the AL pennant, but got swept in the World Series by Cincinnati's Big Red Machine. The Yankees surged back to win the World Series championship in 1977 and 1978 and the AL pennant in 1981. While the Yankees' roster continually changed, so did the team's front office. Managers were hired and fired at a dizzying pace, with Martin often in the middle. The one constant, for most of Steinbrenner's time, was winning. Steinbrenner once was asked his formula for success. He said: "Work as hard as you ask others to. Strive for what you believe is right, no matter the odds. Learn that mistakes can be the best teacher." In addition to his sons, Steinbrenner is survived by his wife, Joan, daughters Jennifer and Jessica and 13 grandchildren.